Sagging numbers for Joe Biden are consistent with bad press he’s received in recent week over his “handsy” demeanor with women–although there’s an argument that Biden’s oblivious response to the backlash has been worse than the actual offenses. 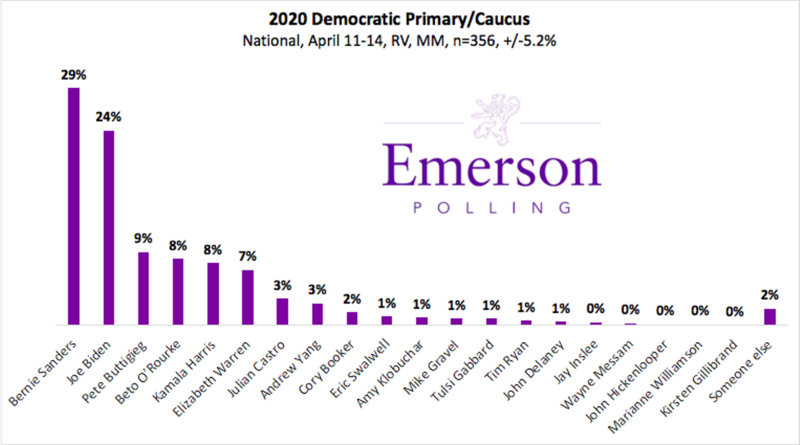 Seeing Bernie Sanders pulling away in this poll is something we can’t place confidence in until we see it corroborated, but Sanders’ superior name ID and loyal grassroots following are giving him undeniable early strength. We continue to be fascinated by the attention being given to South Bend, Indiana Mayor Pete Buttigieg, but the sustainability of his upstart campaign is a question only time can answer. As for basically everybody else in this enormous pack of candidates, including Colorado’s so-far only official hat in the proverbial ring? Nowhere to go but up is what the optimists would say. I like him but it's just not a serious candidacy. We need to focus on who can win the states Hillary gave away. Let us as nit picky liberals try to be more nuanced than 'Hillary gave away'. She won the popular vote. No matter how bigly the dem candidate wins the popular vote in 2020, it won't matter if we don't win Michigan or Wisconsin or Pennsylvania or Floriduh in the outdated EC. Luckily in a WI and MI, some counties barely went for Trump, meaning a better candidate than Hillary could easily win those counties back, turning the state blue. I wonder what happens if Biden does not run? (Which very well may happen) Maybe Amy Klobuchar could pick up a big chunk of that. Apparently John Kerry is waiting in the wings if Biden falters…and no one seems to be able to stop Sanders. Personally, Klobuchar is my #1 pick…..
Kerry is tanned, rested and ready. Is Dukakis definitely out of the running? Somewhere out there they are warming up a tank for use in his campaign kickoff. When did we become a gerontocracy? You look at all of them (Biden, Bernie, Kerry, Pelosi) and it looks like the characters atop Lenin's Tomb during the final days of Brezhnev. We'll see about Sanders. He has never been able to earn a reasonable share of the minority vote and the votes in California and Texas are months earlier this year. His failure to appeal to minorities will be scrutinized early in the election cycle. If Bernie shows up in Milwaukee with 40% of the delegates and two others have the remaining 60%, and join forces, he will scream bloody murder that the system is rigged. And come Labor Day, Donald Trump will lament how Bernie was burned by the rigged system, enticing all those Bernie Bros to once again support Donald's efforts to drain the swamp. That problem will be much worse if the nomination goes to a second ballot and PLEOs (i.e., the much hated superdelegates) join the voting and give the nomination to a non-socialist. I've never understood his failure to attract minority voters. All joking aside, MJ asked me the other day if I would vote for Bernie if he ended up being the Democratic nominee. I gave a flip answer about voting for a centrist third party candidate instead. This is a name ID poll. Get past the top two and nobody else hits 10 percent. Wake me for a September poll. 4 years ago now- same was true for HRC. Actually 3 but we get your point. The difference is Hillary wouldn't have knived the carpetbagger in the back if he had been the nominee. I will vote for the greedy egotist if he is the nominee but will root for everyone else in the primary. I hate the prick as much as I hate Trump. OK maybe not that much but a lot. Any speculation on what will happen to polling now that Bernie HAS both clarified he is a Democrat (and the DNC agrees) and has put out 10 years of tax forms? My prediction? No effect. However, Bernie is the only one in that niche of white males in the top 5 contenders whose policies we have any inkling about. The rest are a blank slate, other than vague labels like "centrist". Hickenlooper is a winner mama and he's a white male. He's not in the top 5 – last I saw, he was #10 or 11? I still like Warren for the win. We as a people still don't really believe a woman can win the Presidency. 2016 feels like just yesterday. I like that most 14 -17 year-old Americans from 2016 will be eligible to vote in 2020. If they show up. And they don't give a hoot for gender or most identity politics. I don't care about assessing whether a woman can win. I know a black man cannot win. oops I know a Catholic can't win. oops Until she does, she cannot. When she does, of course she could. The press doesn't matter much – they didn't stop Tiger from winning. They didn't cause it either. HRC was great with the press. But nothing matters so much as PA, MI, WI or AZ. None of the men have won a national race either, biden just hitched his caboose to Obama's engine. The biggest thing holding back women is women. My wife had a reunion with some old friends recently and one conceded she couldn't imagine a woman being president. I've never had a man tell me he can't vote for women (though I have read that on line.). But I've had women tell me that. Can't think of a time when Klobuchar, Harris, Gillibrand, or Warren won a national race. Can name several male candidates in this who have never lost. Oh- and both Presidents George Bush lost before they won. It's a pointless point but I guess it had to be made. Maybe William Weld will switch parties. again? Who knows, it could be a Schultz-Weld ticket. Weld was an excellent governor of Massachusetts who defeated a rather homophobic Democrat in 1990.